Argentina takes up the bulk of southern South America and has many varied regions and climates as well as many natural wonders that make it an interesting vacation destination. Argentina’s tourism boasts many spectacular natural landmarks, not the least of which is Iguazu Falls. On the border of Argentina and Brazil this area has 275 different falls spanning an area nearly 2 miles wide, making it the world’s largest waterfall and dwarfing the famed Niagara Falls in sheer size and height. 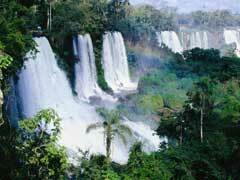 The Iguazu National Park in Argentina protects both the falls and the jungle ecosystem that surrounds them. Travelers to Argentina can reach the falls several ways, the eco-friendly alternative being the Ecological Jungle Train that has stops in little stations along the way allowing visitors to witness all the different sections of the falls without emissions that would damage the ecosystem. Argentina has several deserts within her boundaries, with Salinas Grandes and Salar de Arizaro being salt flats, the Monte Desert which is full of volcanic sediments, rock formations and an arid climate and the largest one, the Patagonian Desert with its cold winter desert topography and climate. 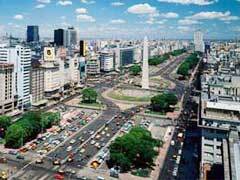 The capital of Argentina, Buenos Aires, is located on the eastern coast of Argentina and has rich and varied history. The Puente de la Mujer is a spectacular pedestrian bridge over the harbor that makes a great backdrop for photos with its shape and design. Close to many shops and restaurants, this bridge is a great tourist attraction that is lit up at night reflecting into the water and making for a stunning show. For those tourists to Argentina who love tall ships, you can’t miss the Fragata Libertad museum. This vessel was a former training ship for young seamen and has now been turned into a museum that houses documents, displays and pictures of what life on the sea was like when she sailed. The Floralis Generica is a massive metal flower sculpture whose petals open and close at sunrise and sunset, much like real flowers do. This art piece sits amid gardens and in its own reflecting pool and makes for something different to see, no matter the time of day or night. For travelers to Argentina who wish to learn about the history of the country, there is no better place than the Museo Del Bicentenario. The admission is free and the displays tell the history of the country for the last 200 years. They also have a restored Siqueiros mural on display. From deserts to glaciers, tourists to Argentina have the unique experience of both extremes. Down south in the country lies Los Glaciares National Park that is full of calving glaciers, lakes and mountain views. Located in Santa Cruz, this national park is home to wildcats, ferrets, foxes, pumas and many species of bird. The Valdes Peninsula is located at the tip of southern Argentina and sits in the Atlantic Ocean. It is a nature reserve and a World Heritage Site that has large areas of barren land, salt lakes, and a plethora of marine mammals that call it home like the elephant seal, fur seals and the Southern right whale. 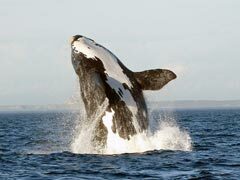 Orcas can be seen just off the coast and the peninsula is also the place many bird species call home. Patagonia is a region in southern Argentina that is one of the least populated places on earth. The area is also home to the majestic mountains, glaciers and forests that can be enjoyed by those more adventurous travelers to Argentina through various tours. The area offers expedition cruises, kayak tours, hiking and trekking tours and wildlife tours for all adventure levels and abilities with duration from a few days to a few weeks. The Cave of the Hands is located just south of the town of Perito Moreno and is a natural wonder to behold. The caves are 9,300 years old and show images of hands painted right on the rocks. Aside from the many hands are depictions of people, animals, symbols and pictures of ritualistic activities that show the history of the ancient people that left them there. Salta is a city in the northern part of Argentina and is home to one of the world’s highest railway at 14,000 feet above sea level. 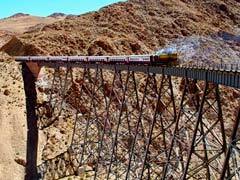 Here tourists to Argentina can take a 15 hour trip along the rails with amazing aerial views. Also in Salta is the Cathedral of Salta that has a statue of the Virgin Mary, circa the 16th century in its ornate interior. At night the cathedral is lit from the square in which it sits which adds to its grandeur. Cerro San Bernando offers spectacular views of the city and travelers to Argentina can take a cable car to the top, or for the more adventurous there are stairs as well. Surrounded by mountains, this area makes for a nice change of pace from the city below. From history to deserts to mountain ranges to forests, Argentina is a country of much variety just waiting to be explored.